I’ve been meaning to catch up on some of my more recent viewings – finding the time between TIFF and other things finds problematic. Anyways, I saw four new films that were generally very good – one of them (Looking for Eric) I’ll put on hold until it gets its US release as to not overwhelm myself with this one. It was a very good feature with an excellent lead, but a very weary final 15 minutes. I give it an 8 – that’ll be sufficient for now. First up is 9 – the animated film everyone wanted to love, but it just didn’t seem to deliver. Of course the mixed reviews left me worst for wear on what to expect, but I enjoyed it nonetheless and was particularly impressed by the design of it all, but more of that in a moment. Since I’m quite late to the races on this one, I’ll just lay down the basics the plot outline had to offer – not that there was really much to begin with in the first place. Primarily the story is about a post-apocalyptic time the world is currently enduring – very few, if any people are alive and the only soul that appears to remain lays within nine stitchpunk dolls; each containing a certain trait the scientist had within him. So you have the athletic one, the dopey one, the strong one, etc… until you had the rounded one that is found laying in an abandoned room not far from where the group stays. He is named 9 after the number on his back and in the midst of making his way with 2 back to his base camp he is taken away by a gigantic metal monster. The rest of the film takes place after this with character contemplating going out in an effort to return the oldest and wisest one of them all. Of course, with an outline like that you wouldn’t expect anything less than prosaic to come from the script – and if you thought this, you’d be right. There is a constant nagging that is emitted from the story: the generic back and forth between ‘good’ (thinks with heart – acts on whims) and evil (thinks with brain – does everything to stay alive). Its a structure that has seen the light of day too many times and one that winds up burning the feature at hand. A few interesting bits of information on the origin of the 9 come into play in scattered areas and are undoubtedly the most intriguing bits of the film. Akin to the rest of the feature, these scenes fly by, but hold far more purpose in doing so. However, however, however – 9 is not a film that deserves accolades or even a second viewing based on its basic merit alone. The story is a tad trite and redundant, to be sure, but its the visual design that completely bowled over this viewer. There is a never ending supply of goodies for the sight, so sorry blind people, this movie isn’t for you (and apparently neither is this review…). Where the story’s primary objective is to sustain the viewer, it is clearly the vision of director Shane Acker that kept most of his audience from reaching comatose. The action scenes are terrific to behold, the explosions and smoke styling are something you’ve never seen before in an animated movie, and the characters and the setting they stand in front of are stunning. I URGE YOU NOT TO READ IMDB’S SYNOPSIS OF THIS FILM – IT SPOILS IT. Recently, I’ve seen Stanley Tucci’s latest directorial effort. It’s a story that duly represents the gradual emotional collapse of two individuals living with trauma, and while having been adapted from a Dutch film, keeps the initial creative European integrity intact. Clocking in at 80 minutes, implemented is a wonder at the tautness the script beholds; how each passing minute is soaked up with a humbled peering into affliction – entirely without pretension. Blind Date is the story of two psychologically perturbed 50 year olds. Don (Stanley Tucci) is a worn-down bar owner. It is assumed that he purchased the bar because he clings onto an old passion of being a magician and does acts sparingly during his daily routine at the bar in hopes of soothing his soul and bringing a little joy into the lives of the few patrons he has visit nightly. On the other hand there’s a fellow despondent soul in Janna (Patricia Clarkson) – a woman that Don has a very inconsequential and surreal relationship with. Dwelling on depression, the two desolates find solace in one and other by partaking in a bizarre ritual. These two cannot cope with their own realities much, if at all, so one of them sets up an ad in a newspaper for the other to reply to – they begin a completely separate existence from there on out. Well, for that night, anyways. This offsets a string of curiously apprehensive auras that all boil down to a brooding enigma at their core. It makes for a viewing experience that will be held with contempt for most viewers (particularly the ones that seek average fare), but for those that believe that the complexity of human tragedy cannot be sufficiently summarized in one or two scenes of bawling and screaming, this will be a breath of fresh air – though, considering the atmosphere built, it will be rather like breathing in a breath of fresh smog. At the start of the third act, the dynamic of the main characters takes a swerve into a more logical route. Still maintaining the solicitude of scenes prior, the switch in purpose elevates the already fascinating subject matter into the type of tragedy Shakespeare made his name off of; beguiling humor et al. Next up is what I consider to be the most surprisingly film of 2009 in My One and Only. Having preconceptions of mediocrity – both because of the rather plain director Richard Loncraine was helming it and Razzie nominated scribe Charlie Peters wrote it – I expected this film to be a fun romp without much depth. To be sure, it didn’t have much depth and it was delightful paced with snappy humor and fermenting performances. In fact, I don’t believe I’ve called similar films anything more than good, but there was a key ingredient in the aura Loncraine composed that allowed this feature to resonate with me so strongly. Opening with narration is a major no-no. To me, if you cannot explain what you want through dialogue or nuances (unless the entire feature is from one quiet person’s perspective, then of course its fine) and have to resort to such an obvious extreme, you cannot compose a story correctly. Immediately this worried me and instantly made me embrace the commonness I was about to behold. Fortunately after the unnecessarily fragmented opening scene that recounts sixteen year old George Devereaux’s (Logan Lerman) coming to having purchased a rather festive automobile the story takes off with as much surprising sturdiness and freedom that unlicensed George experiences behind the wheel of the car later on. The 1950s: doo-wop is prominent, clothing is quickly progressing into a fashion that doesn’t rely on dress attire as a constant and the fundamentals of family as weary as ever with partying on the rise. One afternoon after a shopping spree in a distant town came to a premature close, Anne Devereaux (Renée Zellweger) walks in on her husband, Dan Devereaux (Kevin Bacon) with another woman. Immediately I find something I admire in the film in how Dan is represented. He’s a fairly large success in the world, but he doesn’t speak with the confidence one would anticipate; molding him into a successful loser of sorts. Rarely does one see such peculiar crafting of a character that is only present in a handful of scenes, but it adds an unfounded depth to the story where there often is not. Realizing that her husband’s ways will never change, she snatches up her sons George and Becker (Troy Garity) – looking for a new place to call their home. As they drive around major cities across America without a definitive place to stay and without much money to keep them in any one place very long, their journey proves much more difficult and far less picturesque than Anne once imagined. When its revealed her primary plan is to seek out old flings in cities she used to frequent, the viewer gets an accurate envisioning of who Anne really is and how flimsy her code of ethics is. These scenes would prove to be especially grating to endure if not for the very snarky purpose Mr. Peters imposes on every given situation. Not to mention that when she finally bumps into an ideal man for her and her boys in Bill Massey (the highly underrated David Koechner), every viewer will find themselves in for a prolonged treat. One of the most delightful scenes of the year come from this cataclysm of contempt; illustrating the resiliency of any family, no matter how tattered. With this, her antagonistic persona develops frequently by way of her self-serving manner and carelessness for the lives of both her children. And although our protagonist in George is very refined in his realization of the world and his boundaries as a youth, these constant stretches of time that pump more and more neglect into the already broken family do prove an emotional blow for the youth. In concept, I would say this story lacks the basis for anyone to truly appreciate it. However in practice, I cannot give it enough laudation. The visual designs alone will make fans of the 50s salivate – they’re so delicious you feel as if you can taste them. As previously stated, the cast is excellent – Bacon delivers yet another crafty supporting performance which overwhelmed me plenty. Not to mention the great lead performances by both Lerman and Zellweger. To me, Lerman is taking impressive steps to advance his young career – taking on roles that you’d expect Zac Efron to in wanting to legitimize his. All in all, My One and Only is as genuine as it is a joy to view. It is what Away We Go wishes it was in terms of sincerity and inquisitive toward the strength of the family structure. This feature succeeds so much so that I was found surprised that it wasn’t adapted off of a novel. Its a coming of age story on both sides of the coin – both George and his coming into realization with his strengths and purpose in his family, as well as Anne and her understanding of the role she plays as a mother to two young men. Here we finally are – both in that I’m in the final stretch of doing a bundle of reviews for the first time in over a week and that I only now got to one of the most talked about films of the year. 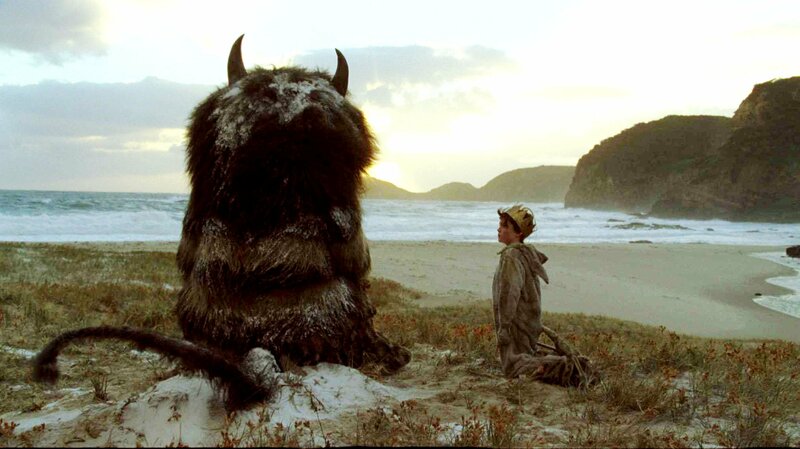 Where The Wild Things Are – a beloved children’s tale that takes all of three minutes to read – is now a two hour feature. In it, director of the film Spike Jonze and Dave Eggers author this adaptation that focuses primarily on the strain that is experiencing childhood for those with abandonment issues. Max (Max Records) is a sufficiently lonely youth who is hyperactive because of his solidarity. He urges for others to accept him, but above all, play with him. He’s an imaginative kid who seems to have a fair clasp on the world, how it works, and how its inhabitants struggle. Even with this worldly view, he finds himself dwelling deeply in his own endeavors. After a tiff with his loving mother (Catherine Keener), Max runs into a dark, dilapidated forest and allows his imagination to run free, if only to relieve himself of recent anxieties. Now in a wondrous land, he encounters Things – large-headed and fury interpretations of otherwise logical animals. Each represents a part of his own struggle, but he resonates most with Carol (voiced by James Gandolfini) who is a manic depressive that only wishes for eternal happiness. Runner-up for most comparable to Max would be Alexander (Paul Dano), who has a fragile, but well-to-do persona and only wishes for an equal voice amongst the Things. Additionally, Alexander plays the most important role in Max’s growth later on in the feature – the entire subplot about neglect and sharing the care is one of the few major benefits the script by Jonze and Eggers produces. Early on, Jonze sets the comedic atmosphere for the film; it’s very self-defeated, deadpan. In watching the film progress, this generally just seems to be conjured to make the pacing chug along well for more mature viewers, but upon pondering it, Jonze attempts to make a generalization about people nowadays and their attitude towards the collapse of everything they know. Either way the story profits from this thinking. Especially a line uttered early on to show Max’s desperation aptly when he shouts at a fence and tells it to “go play with its fence friends”. Absurdly hilarious (or rather: hilariously absurd) material. In fabricating both a story for children and adults alike, the duo find themselves in several situations that seem to have been abandoned in hopes of people “just getting it”. There are moments done clearly for the betterment of youths viewing the film and moments done to wow adults with insight, but rarely do they try to create a cohesive product that is for both age groups all the time; leading to a very uneven affair. Although Jonze’s style – both in impressive visuals and a peculiar soundtrack that is a spin off of the current sounds coming from Scandinavia (think Mum, Sigur Ros and Mew) – does compensate for this slightly, it certainly doesn’t refine the film enough to be taken completely seriously for the older viewers. In essence, Jonze captures the singular entity that defines a child’s mind in carefree playfulness. Any scenes you witness that contain frolicking of any sort can be applied to a dictionary and pointed to when looking up the word “perfect”. It is only that a fair share of scenes that make up for the rest of the product feel residual. And, of course, you cannot have a film entirely about children playing. Spike Jonze likes to use symbolism to impress themes upon his viewer. However, in concocting the design of this feature, he severely misplays a quality he’s known to be consistent with, and while still using symbolism to teach, he does so in a manner that treats all of his viewers like children. With hackneyed gestures like “the rebirth” of Max in an intellectually offensive way or the one divisive Thing, KW (Lauren Ambrose) feeling uneasy in enjoying the company of Owls (creatures that like to get high; fly), Jonze overplays the purpose of the feature and does so in pretentious territory. Even with the lack of unity, odd atmosphere and obvious messages (clearly done so for children to grasp, but it is the way they’re demonstrated that have sensations of stupor), Jonze’s final product is hardly a negative one. Evidently, Spike has an admiration for creating idiosyncratic essences upon which his films run. I had trouble grasping Where the Wild Things Are as well. Its story is so awkward and strange, yet surprisingly poignant and strong. Its a film that I will say this; the story is average, but everything surrounding it is PERFECT, so it changes my view on it. Seriously, the cinematography, the editing, the costumes, art direction, AND THAT SCORE. ;) Its phenomenal. 9 and My One and Only came and went before I had a chance to see them. That review sounded nice for the latter. I will have to see it. Some time. Have you ever tried submitting your work? You are only what, seventeen? Or older? Well, however old you are, you are excellent at writing. Just a lot of work? Got As in English? Film student? Yeah man, you must try and see My One and Only. I know a lot of people take for what I expected to take it as, but there’s a quality to it that might click with you as it did with me. Only once to Toronto Film Critics Association, but they never replied to me. Yeah, I’m 17… not in college or anything (yet? ).